Carbon Monoxide (CO) is known as ‘The Silent Killer’, because you can’t see it, taste it or smell it. The only way to detect the presence of the deadly gas is to install a carbon monoxide alarm. 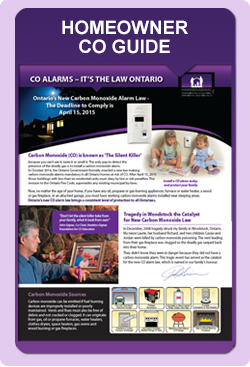 In October 2014, the Ontario Government formally enacted a new law making carbon monoxide alarms mandatory in all Ontario homes at risk of CO. After April 15, 2015 homeowners and landlords with buildings housing 6 residential occupancies or less are required to comply with the law or risk penalties. In these informative videos, John Gignac talks with three experts to get their perspectives on the new law and advice on how to keep families safe from ‘The Silent Killer’. Our new “Get to Know CO” Videos could be the most important videos you ever watch. Watch all three today. 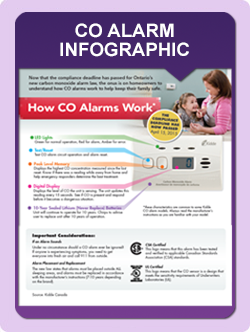 Need a CO Alarm to Comply With the New Law? If your home is not currently in compliance with the new law, you are required to install a CO alarm outside all sleeping areas. Or if your existing CO alarm was manufactured before 2008, it needs to be replaced. 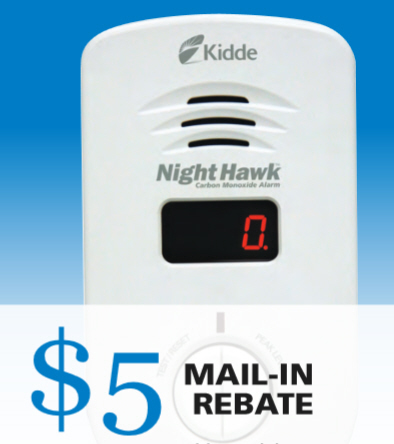 Save on your next purchase with this special mail-in rebate offer from Kidde Canada.